A smart two bedroom, ground floor apartment located on a quiet residential street. 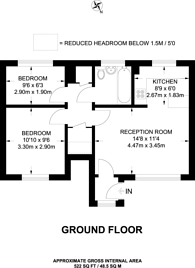 Boasting a good-sized reception room with open-plan kitchen, and plenty of storage space. This property is located on a lovely quiet residential street within range of local schools, with Royal Albert DLR and Beckton District Park both within easy reach.